Love Yourself , then you can love Others!!! Are you constantly putting yourself last????? Do you feel Overweight? Tired? Have Skin problems? Cellulite? Insomnia and Brain Fog? , processed foods, synthetic drinks and medications. One of the ways the liver deals with impurities is to increase body fat to enfold these impurities to protect the body from their influence. Diets are not successful for long term weight loss because they don’t address the need to cleanse the body of impurities. Cleansing is a safe, healthy, and natural way to achieve a healthier, leaner body and clearer beautiful skin! What is Isagenix? Cleanse for Life? It is a simple system to help you along your road to optimum health. Two shakes a day (curbs your appetite) and a simple well-balanced meal along with a Cleanse Day once a week will yield outstanding results in just one month. After one week you will be feeling great with tons of energy. Its simple, effective and great for those on the go. I know, I started Isagenix and a month later had lost 15 pounds. I was surprised at the drop in weight so quickly and so have kept on a maintenance program since. We have had several long term guests that were overweight, sick and tired. They saw my transformation and asked how? The rest is history, a 40 pound and 60 pound weight loss ensued and they have maintained the weight loss for over a year. Then came a new hairstyle, attitude – A transformation!!! At Paradise Beauty Salon we are here to assist you with your transformation, from the inside out. We have beautiful skin, hair and body treatments to help you shine on the outside as well! and filled with pollution/ dirt/debris. Detoxing can purge the skin which can result in blemishes, so let us help. Call for a free consultation, a taste of our protein shake and a Cleanse for Life drink with our Detoxing services and get you on the right track for 2017! To Your Good Health and Looks! Love Yourself ! 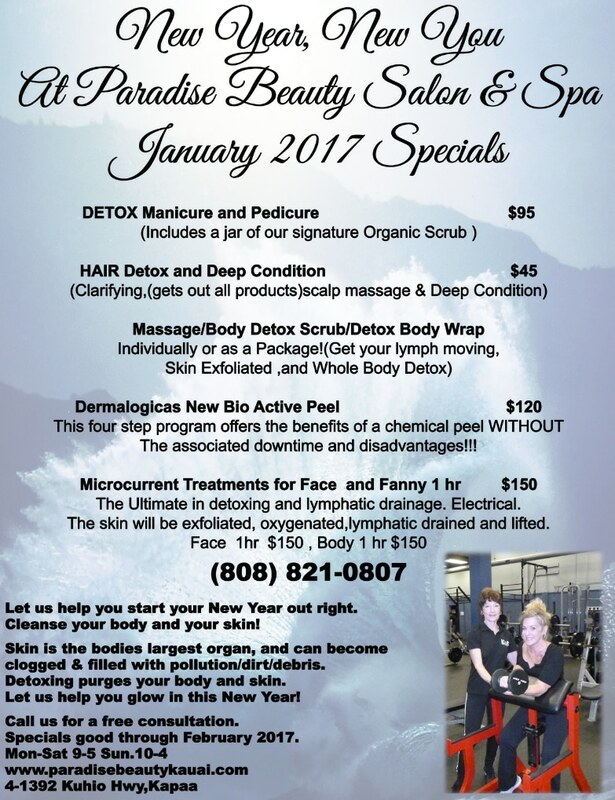 Our Specials are good through February 2017. Call us at (808) 821-0807 and ask for Liz, we can help!!! !